These companies were all rated A- or better by our readers within the categories below. By now most people are quite familiar with Steven, the Dell dude, whose surfer-relaxed persona conveys the message that if you buy a Dell, you won't have to worry about a thing. And in the context of desktop PCs, it looks as if our readers agree. Consistently on top in sales, Dell continues to get high marks for its service and reliability, receiving an A in the overall desktop category for the 11th time in 12 years. to view the overall results of our desktops survey. Our Readers' Report Card grades (A through E) are based primarily on answers to four key questions: overall satisfaction, satisfaction with reliability, repair frequency (units needing repair in the past 12 months), and willingness to buy again from the same company. Six overall grades have changed since 2001: Acer and Sony move up, while Hewlett-Packard, IBM, Micron, and locally built desktops move down. Last year, locally built PCs (our term for white boxes assembled by thousands of small operations across the country) had A's overall and for office use. This year, the overall grade falls to a B+. to view the survey results among office- and home-use desktops. Micron earned A's last year in the overall and home-use categories; this year, with fewer responses and two lower scores, its overall grade falls to B. And in the home category, when we asked, "Would you buy from Micron again?" respondents gave it a worse-than-average score; this, along with average scores on the other key questions, drives its grade for home computers all the way down to a D for the first time. The "buy again" responses reflect not only the level of satisfaction with current PCs but also perceptions of Micron's likelihood to maintain a strong presence in the marketplace. In the wake of last year's poor grades (E's both overall and for home use), eMachines claims to have beefed up technical support and made doing repairs easier for dealers, but improvements have yet to show up, and the grades remain the same. Often it takes more than a year for changes in support to be reflected in users' opinions, so we'll have to wait and see how eMachines fares next year. to view the results our satisfaction survey. Not only does Dell have the best score for the percentage of desktops needing repairs (notebooks are a different story), it does the best job of solving repair problems inexpensively. Of the Dell respondents overall, 31 percent say their problems were solved over the phone (closely followed by Gateway at 28 percent, versus the average of 23 percent). In 8 percent of the cases, HP solved problems in the most expensive way, giving the customer a new computer; across companies, the average score is just 4 percent. Only 7 percent of the "locally built PC" respondents and 9 percent of IBM respondents say they got the runaround from technical-support staff, compared with 22 percent for Compaq and 20 percent for HP. Not every Dell customer loves Dell. Several customers find communication with Dell difficult, complaining that some of Dell's phone-support staff speak English poorly. In addition, as we drill down to ask about satisfaction with in-warranty repairs, Dell surprises us with a worse-than-average score. To use our survey results best, choose the table that reflects your intended useoffice or home. If you want to compare among the most brands, look to the overall table. No single size or type of server is correct for every purpose, so we're not surprised that our three Readers' Choice winnersDell, Sun, and locally built serverstypify the range of offerings in the server market. to view the overall results of our servers survey. Dell receives significantly better-than-average scores on every key measure except satisfaction with repair service, where it is average. Sun and locally built servers are average on repair frequency and better than average otherwise. With servers so critical to business, users demandand get better support than with their counterparts. On a scale of 1 to 10, where 10 is best, respondents score satisfaction with technical support at 7.3 for the category as a whole, versus 6.7 for desktops and 6.4 for notebooks. Only 11 percent of server respondents say they got the runaround when calling for help, compared with 15 percent of desktop users and 16 percent of notebook users. to view the most common causes of server failures. Cross-tabulations also show a correlation between operating- system type and system reliability: Respondents clearly feel their Unix servers aren't down as often. Although Windows dominates as a server operating system by almost 6 to 1 on this survey, respondents show greater satisfaction with servers running Unix and report them to be more reliable. Among Windows-based servers, software is the second-most-common reason specified for a server needing repairs (drives are far and away number one), and Unix boxes' software is third, after drives and power supplies. "We've never had a [hardware] problem," says a manager of three Dell servers, "other than issues related to Microsoft software." 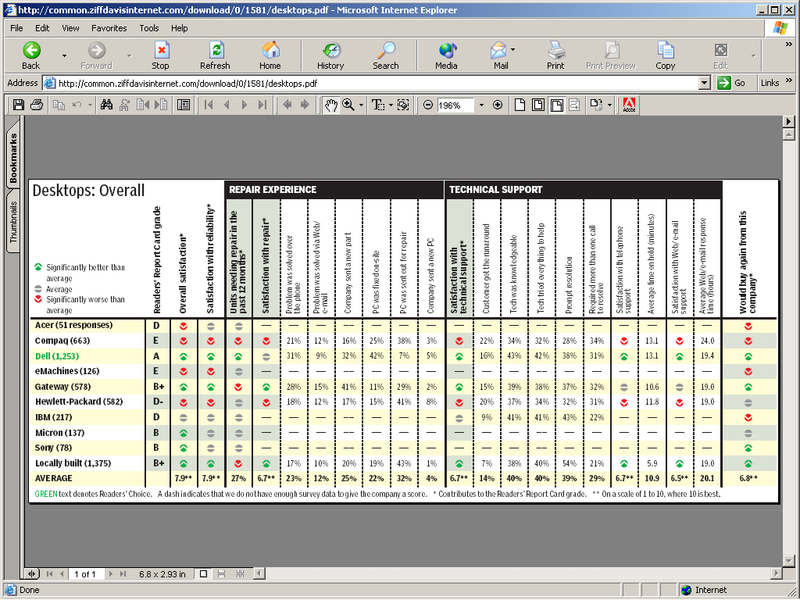 Although Dell received an A last year and Sun wasn't rated, locally built servers jump all the way from E to A. IBM moves up from C to B+ (with improved scores for satisfaction with reliability and with technical support, as well as the likelihood of buying again), but high repair-frequency records drive partners Compaq and HP from C to D and C to E, respectively. Gateway falls one grade to E, and Micron, not rated last year, earns a D.
For Compaq, HP, and IBM, an additional challenge will be Dell's aggressive pricing. As one user says of HP, "[It's] very reliable equipment but expensive. Less expensive machines seem to be just as stable these days." Locally built servers are providing extraordinary levels of service for small and medium-size businesses. Just 6 percent of the respondents who use locally built servers say technical support gave them the runaround, the same percentage as for Sun; all other companies' scores range from 11 to 16 percent. Technical-support staff for locally built servers answer the phone about 2 minutes sooner than any of the other companies, and 3.3 minutes sooner than our average response time. Our 15th annual reader survey of service and reliability expands to include digital cameras, PDAs, and home-networking gateways, in addition to desktops, notebooks, servers, printers, and ISPs. The survey measures the reliability and service experiences of PC Magazine subscribers and visitors to PCMag.com and ExtremeTech online. We e-mailed a link to the survey to a random sampling of subscribers. We then asked them to tell us about products they own in up to three categories, based on information provided on an initial screener. Each respondent was allowed to submit only one completed survey. We received approximately 15,000 completed surveys. For each key question, we compare each company's score (average rating) against the average of all the companies' scores in the same product category. The result is characterized as significantly better than average (and assigned a value of 4), average (2), or significantly worse than average (0), based on statistical testing of the responses to a 95 percent confidence level. To include a given company in our analysis for a given category, we had to receive at least 50 responses to the key questions. In the hardware categories, four questions determine each company's letter grade: overall satisfaction, satisfaction with reliability, units needing repair in the past 12 months, and likelihood of buying again from the company. To receive an A grade, a company has to average better than a 3; for a B, the company needs to average better than a 2; for a C, exactly 2; for a D, 1 or better; if the average of all the values is below a 1, the grade is an E.
Two related questionsone on satisfaction with repair service and the other on satisfaction with technical supportallow for pluses or minuses on grades for companies with sufficient responses to those questions. To receive an A+, however, a company has to have better-than-average scores on all four key questions as well as on the other two. There are no E-'s or E+'s. Companies with A-'s or better receive the 2002 PC Magazine Readers' Choice award. For ISPs, we calculate grades based on responses to eight key questions: overall satisfaction, initial setup, rates, technical support, connection at the highest speed, connection reliability, speed of page downloads, and e-mail service. Readers' Choice designations go to ISPs with an average of 3.5 (A-) or above. CleverForm (www.cleverform.com) hosted this survey, which was live from early April 2002 to early May 2002. The Strategy Group (www.tsgonline.com) tabulated and verified the survey results. For you, the consumer, a technical-support call is usually free. For the company you're calling, it's extremely expensive. With help from Motive Communications and SupportSoft, two businesses that sell intelligent support software, many companies are making an effort to improve the quality of support they provide and reduce the length and the number of calls they take, thus improving the bottom line. When you make a support call, a company must pay for the call itself and the support rep sitting on the end of the line answering your questionsplus all the equipment he or she uses. The longer it takes to resolve your problems, the more the company must spend, and sometimes that can take very long indeed. "In helping customers, our average call is somewhere between 15 and 20 minutes," says Mark Kuess, manager of business development at 3Com, who scrutinized the company's support practices over the past several months. "We have to spend time asking simple questions like 'Is your computer turned on?' or 'Is your card plugged in?' before even getting to the really hard questions." And in many cases, one call isn't enough to solve the problem. Providing support via e-mail as well as phone can reduce costs somewhat, but it's still time-consuming for the support reps who answer e-mails. "The cost of labor is the biggest expense at any support center," explains Tony Adams, a principal analyst with the research firm Gartner. "You're perpetually having to write those nasty paychecks." In an effort to reduce such costs, many high-tech companieswhether they sell servers, software, Internet access, or computer-enhanced carsare building intelligent support applications into their products, which can help reduce the number of calls and e-mails they have to field. Sometimes these applications let users fix problems on their own. Sometimes the apps link back to company support reps, feeding them data about the product the reps might be hard-pressed to gather from a given user over the phone. This way, the company can help the user solve problems much more quickly. The rub is that the costs associated with these applications are often quite high. IBM, for instance, has put $5 million into the development of Project eLiza, a way for servers to heal themselves without human intervention. But developing the tools isn't the only cost, says Adams. "You also have to keep updating them, and that becomes a ball and chain around your leg." Companies may find purchasing such software from vendors that specialize in intelligent support tools more economical. "For most companies, producing software like this is not their core competency," says Adams, "and it's often cheaper to buy [the software] from somebody else." 3Com, for instance, went to Motive for the tools at the heart of its Connection Assistant, the support application that ships with the company's line of Edge network adapters. Available with each Edge product and from the 3Com Web site (www.3com.com), Connection Assistant not only helps customers install their adapters, quietly alerting them to potential issues and often solving problems on the fly, it also lets 3Com support reps access customers' systems over the Web and gather information that can help them service adapters after installation is complete. Customers can request assistance straight from the application without having to pick up the phone, and when 3Com's technical support accepts requests, the service reps can immediately determine what types of systems the customers are using, what software they're running, what their network settings are, and so much more. According to Kuess, who first set up 3Com's relationship with Motive, this tool has indeed reduced support costs, cutting the length of the average support call by 75 percent. "Many times, we get a 20-minute call down to a mere 5 minutes," he says. Motive's support tools can be applied just as easily to software applications (such as Microsoft Great Plains, a set of finance tools for small businesses) or to broadband Internet access services, such as Verizon. With the latter, Motive partners with a company called Visual Networks to help Verizon better serve its DSL customers, providing a tool that, much like 3Com's Connection Assistant, helps with installations and links systems back to support reps.
SupportSoft, the Redwood, California, company formerly known as Support.com, provides similar support services to high-tech companies, helping IBM repair its PCs and laptops and partnering with a company called BroadJump to provide Bell South with DSL support tools. Motive and SupportSoft have relationships with companies across the industry, but not everyone is sold on the benefits and cost-effectiveness of their tools. Because users must customize the tools for each new product, many companies still end up spending a great deal of money in development and maintenance. In the past year, two high-profile names, Dell and PeopleSoft, ended their relationships with Motive. And Micron and Everdream terminated relations with SupportSoft. "Motive requires quite a bit of engineering to get a project working, and you spend a little more each time you change your product line," says Gartner's Adams. "And though it's a slightly different kind of customization, you have to deal with customization on the SupportSoft side as well." Furthermore, support applications will save companies money only if customers use them. "That's the biggest obstacle," says Adams. Any customer that gives them a try, however, will likely be pleased that they're able to cut down the time on the phone and will likely use them again. And each time the tools are used, a company is more likely to see its support costs decrease, boosting its bottom line. We've all been there: frustrated almost to the point of combustion while talking to someone in technical support. To help deal with the frustration, we went behind the scenes to get the scoop on what life is like on the other end. PC Magazine contributor Sarah L. Roberts-Witt went to Hewlett-Packard's enterprise customer service center in Atlanta. Despite several low grades in our survey, HP seems dedicated to customer satisfaction more than ever, thanks to its merger with Compaq. First we met Derinda Cook. Cook is a PSA (personalized service agent) on the front lines. The minute a call comes in, a screen pops up on Cook's PC, telling her who the customer is and the region he or she is calling from. She introduces herself and finds out the type of service needed and the urgency; then she gauges the customer's mood. Cook then redirects the call appropriately or pages a field technician. Once she finds the right service engineer or field tech, she follows the progress of the phone call and monitors the quality of the support to ensure that a customer's contractual service obligations are met. Next we met Todd Whitcher. He is known as a back-line agent. Whitcher is an engineer who is intimately familiar with networking and HP hardware; he's the one Cook turns to. Like Cook, Whitcher spends most of his day wearing his telephone headset, jumping in and out of a slew of applications, such as WebEx, a secure collaborative tool that lets him remotely access the systems that are having difficulty. "Sometimes things get lost in the translation when a customer is trying to explain a configuration issue." Cook and Whitcher are but two of the 1,400-person support staff members located at the Atlanta centerone of seven such centers scattered across the United States and Canada. A relatively low-volume facility, the Atlanta office handles around 200,000 support phone calls per month. A sister center in Boise, Idaho, which deals with support calls for business printers, client PCs, and networking equipment, takes around 670,000 calls per monthsome 4 million minutes of phone time. Whitcher, who works the 7:00 A.M. to 4:00 P.M. shift, describes the approach for his group as a technology boot camp. In his first six months, when he wasn't handling cases, he was attending HP classes on the company's Unix variants. Of course, both PSAs and support engineers are encouraged to improve their skills by taking certification classes. But both Cook and Whitcher agree that many of the necessary skills come with time. For example, you learn to read customers more quickly. And over the years, communicating effectively over the phone, as well as chat and e-mail, becomes a true art. But we haven't yet answered the big question: How do Cook, Whitcher, and their colleagues keep from losing their cool? The answers are as diverse as the staff itself. But they all agree that at the end of the day, keeping the customer happy is all in a day's work. Ready to go shopping? Be sure to print out the overall ratings for these categories and slip them in your wallet or post them on the bulletin board or refrigerator. They're great quick guides for identifying companies with the best service and reliability records. Copyright (c) 2002 Ziff Davis Media Inc. All Rights Reserved.